Last night, business and association executives, as well as senior public servants, gathered at our annual Crystal Ball Symposium to hear from leading experts on how trends in technology, the global economy and international politics will affect Canadian business 2019 and beyond. This year’s event featured Linda Mantia, Chief Operating Officer for Manulife. Responsible for globally leading corporate strategy and corporate development, analytics, technology, marketing, innovation, human resources, regulatory and public affairs, global resourcing and procurement, and the global program office. Ms. Mantia and the Canadian Chamber of Commerce’s Chief Economist Trevin Stratton discussed topics ranging from the growing economic divide and the national economy to strategies for businesses during this period of change. In the report, released today, we lay out what we heard over the course of the last year about the environment businesses expect to be operating in throughout 2019 and the implications that has for policy-makers and business leaders. 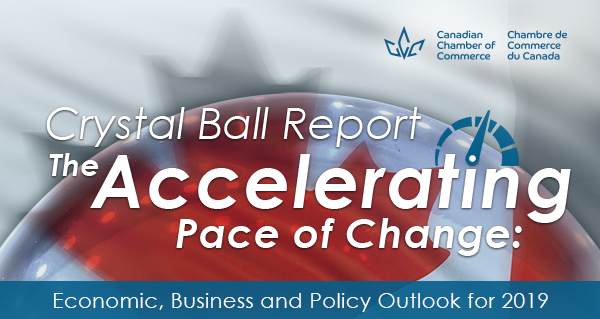 Click here to read this year's Crystal Ball Report. because you signed up to receive information from the Canadian Chamber of Commerce. Unsubscribe from this list. | Forward to a Friend.